I have tried to watch Martin Scorsese's 1973 tale of sins and sinners, Mean Streets, before. I failed to make it through it. I think I might have been under the influence of something and fallen asleep. I was in college at the time after all. Anyhow, I did it right this time. And on first full viewing alone, this film stands as a movie that doesn't totally work for me, or maybe at all. It's there visually, and I mean really there. Let's say this: On reaction alone, when this movie works, it really works. When it doesn't, it really doesn't. The big opposition for me comes with the backbone of this thing, the plot, or lack of plot. I like the simplicity: A small-time Little Italy tough named Charlie (Harvey Keitel) struggles with an unstable best friend, Johnny Boy (Robert De Niro), a secretive relationship with the epileptic Teresa (Amy Robinson), and, most importantly, his own demons, as driven by deep Catholic guilt. Charlie is on the up-and-up with made guy, Michael (Richard Romanus), and even with the higher-ups, including his uncle Giovanni (Cesare Danova), but the obstacles in his path and his compassionate demeanor keep him from the kind of success he thinks he wants. What I don't like is the lack of continuity, the randomness. Consider a scene about half-way through the movie where all-of-a-sudden it turns from night to day, then Charlie is in his bedroom with Johnny looking at Teresa across the alley through a window, cut to Charlie in bed with Teresa, then a couple scenes later, out of nowhere, Charlie and Teresa are talking about their relationship on a beach. Do movies always have to be linear? No. And, I get what Scorsese and Co. were trying for here. The goal is to tell a story about a character in his time and place within his own mind. I don't think they quite pulled it off. I struggled with these odd cuts, and it weakened the care for the characters, especially Charlie, I had started to build up. The look and sound of this movie are everything we've come to love about Scorsese though. I will not deny that I had a blast watching most of this movie. There are scenes here ranking up in the best I've ever seen. I need to amend my Thirty Cinematic Moments list. Seeing Scorsese at the beginning of Scorsese. That's what this movie is. The opening scene narrated by Scorsese himself, Charlie wakes from a nightmare, The Ronettes "Be My Baby" carries us into the brilliant 8mm title sequence, a brilliant short film in and of itself. The tracking shots in the bar, painted in reds to highlight the sin and guilt. The use of The Rolling Stones' "Jumpin' Jack Flash" to introduced the Johnny Boy character. The introduction of Robert De Niro himself. So young, so smooth and fast with his words, weaseling around his payments, owing money to everybody. The opposite of Jimmy Conway, his Goodfellas character. 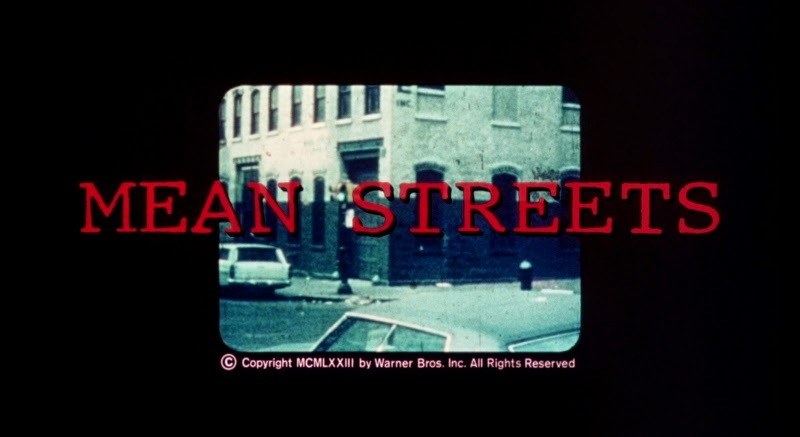 If Scorsese's Goodfellas (1990) is about the polished mobsters of New York at a certain time, then Mean Streets is about the lowly hoods playing polished mobsters, complete with nice shirts and suits and that twisted Catholic guilt. [Scorsese's] style is displayed joyously in “Mean Streets” as Charlie and friends go to collect from a pool hall owner, who is happy to pay. But then Johnny Boy is called a “mook,” and although nobody seems quite sure what a mook is, that leads to a wild, disorganized fight. These are not smooth stuntmen, slamming each other in choreographed action, but uncoordinated kids in their 20s who smoke too much, drink too much, and fight as if they don’t want to get their shirts torn. The camera pursues them around the room, and Johnny Boy leaps onto a pool table, awkwardly practicing the karate kicks he’s learned in 42nd Street grind houses; on the soundtrack is “Please Mr. Postman” by the Marvelettes. Scorsese’s timing is acute: Cops barge in to break up the fight, are paid off by the pool hall owner, leave, and then another tussle breaks out. Like Ebert, I find this to be one of the most genius fight sequences out there, simultaneously illustrating Scorsese's mastery, even then, of the camera and his own distinct style, while also developing the characters, young men who want to seem like tough guys but really aren't. Everything in this movie ultimately comes down to Charlie's battles with his own self-loathing, his feelings of guilt along with his inability to get away from sin. When he's alone, he seeks some form of forgiveness. He prays. He tries to reconcile and to rationalize, only to suit up and go out to the bars and drink and lust. Another great sequence finds Charlie dressing in his finest suit on his birthday. He goes to Tony's place, says a prayer, then the shots of Scotch begin to flow. 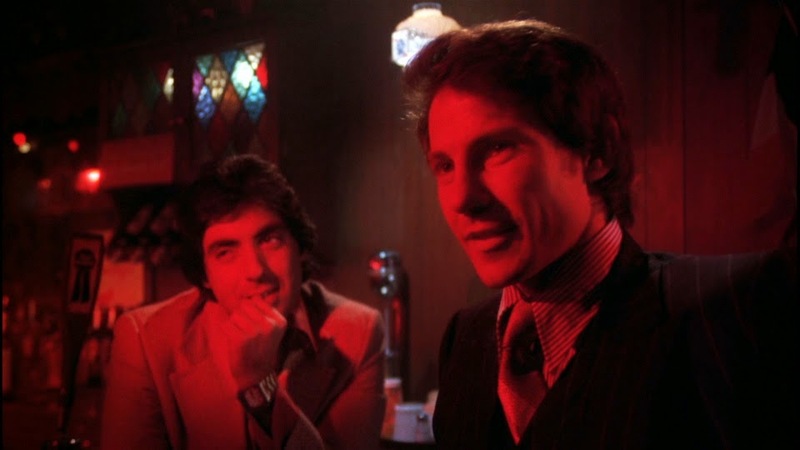 Scorsese's camera is attached to Keitel, who meanders around the bar to "Rubber Biscuit" by The Chips. It is one of many scenes bathed in sin, colored in red, followed by guilt. It is masterful. Similarly, another scene has Charlie vocalizing his inner monologue in the car with Johnny Boy and Teresa in the final scenes of the film. When he does so, they laugh. Oh, if they only knew how it would soon end. I used the word meander a minute ago. That's what Scorsese's Mean Streets does. Within that, there are moments of pure cinematic perfection, of joy for the audience, especially Scorsese junkies like me. The aimless meandering, however, which I suppose is the point, doesn't quite work for me in making this movie a complete, enjoyable experience. There are individual shots and sequences the likes of which had never been seen and have never been seen since. But it's not really enough. While it does come together in supremely exciting and satisfying ways in the end, I still found moments throughout the picture that either bored me or turned me off. 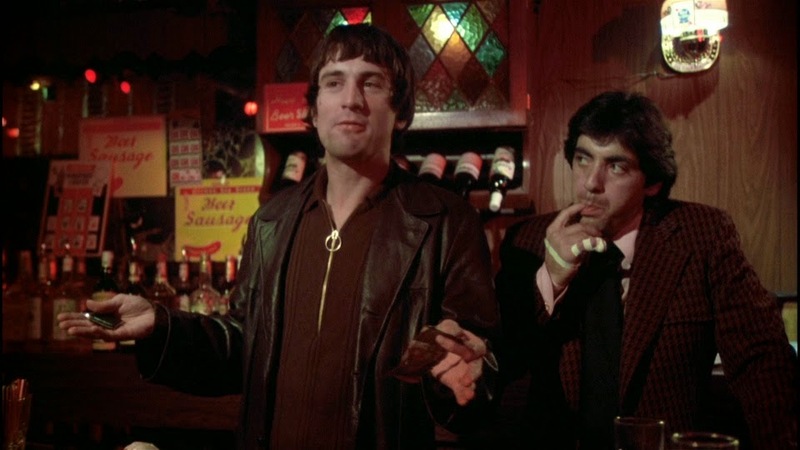 Mean Streets is one Scorsese movie that I can honestly say I don't love. But I admire and appreciate it. And I undoubtedly need to see it a second time. I also need to see this again. When I saw it a few years back, I thought it was decent, but it didn't stick with me and didn't inspire me to give it another shot. However, reading this review reminded me how much it didn't stick because I don't remember much of it at all. Being a big Scorsese fan, myself, I certainly want to revisit this one. Great review. Yeah. It only has moments that have really stuck with me so far. It really doesn't work as a whole. I NEED to see it again. Thanks, man! Your last paragraph is exactly how I feel about this. EXACTLY. De Niro is perfect though, and should have won an Oscar. Right on. There is so much to admire about this movie. So much. It just doesn't totally work. And, you're so right about De Niro! I downplayed his importance in what does work about this film. He is incredible.